Conjure thoughts of the animation’s early years in the 20th century – the black and white era of the 1920s and ’30s that gave us everything from Steamboat Mickey to Felix the Cat – and it’s unlikely you’ll feel particularly unsettled as a result. Enchanted perhaps, maybe even a little nonplussed, but scared? It’s simply a connection very few of us would ever make. 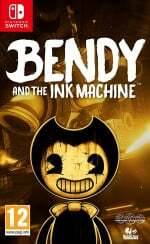 And yet, here comes theMeatly Games with a survival horror experience set within a twisted and corrupted animation studio that takes a childhood form of entertainment and makes it nightmarish. 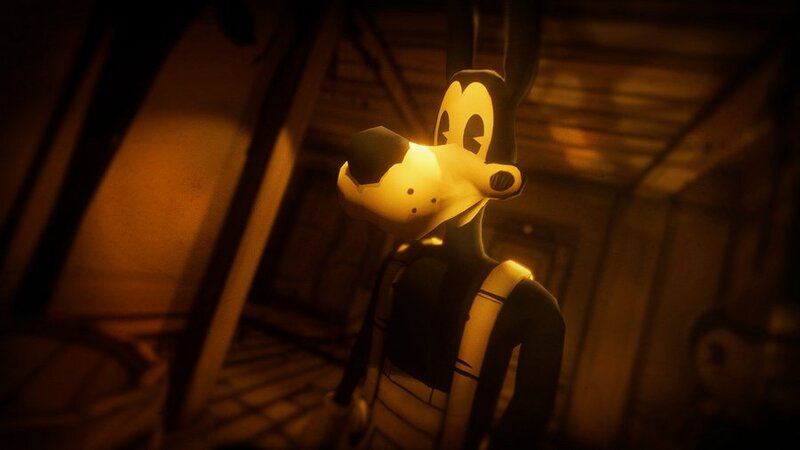 Originally released on PC as an episodic series, Bendy and the Ink Machine places you in the shoes of one Henry Stein, a retired animator who received an unusual letter from his old employer. It’s been 30 years since you last spoke to Joey Drew - back when the studio was at the top of its influence, producing a string of popular shows including the titular Bendy - but as Henry soon learns upon his return, it’s now fallen into considerable disrepair. Where are all the animators? Why is there is ink seeping through the walls and what on earth is the Ink Machine, anyway? Over its five chapters, the answers to these questions are slowly revealed as you push further into the studio’s labyrinthine depths. As with most horror games of recent years, Bendy And The Ink Machine flits between environmental puzzles, exploration and evasion. There’s a small amount of combat, but mostly you’re tentatively searching new corners of the studio and running for your life as you encounter the products of Joey Drew’s mad attempts to revive his fortunes. It’s unsettling in a similar fashion to Layers of Fear: Legacy but with a greater emphasis on jump scares. 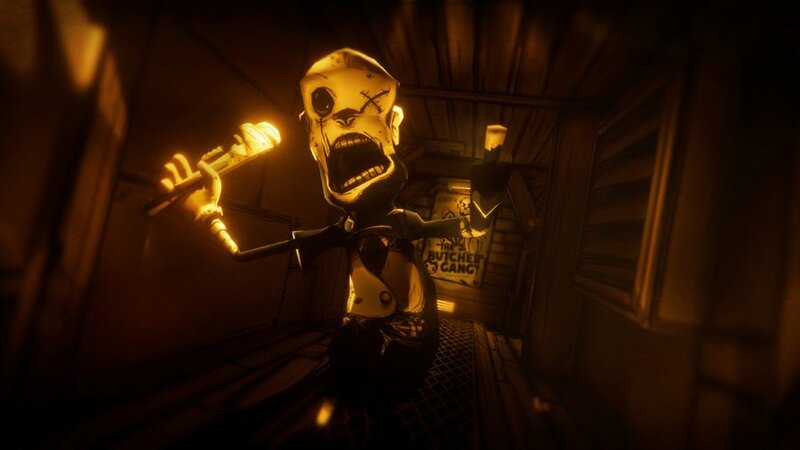 From the way wooden cutouts of Bendy will suddenly slide into view around a corner, or how doors will eerily open themselves to reveal the scares within, Bendy And The Ink Machine is constantly trying to keep your adrenaline pumping, especially in the middle and later chapters. It’s an experience that’s always at odds with the visual style, which gives everything its own lived-in cartoon feel that perfectly captures the charm and whimsy of black and white animation. The fact that many of its enemies draw on this era means you’re consistently unsettled by this corruption of something seemingly innocent and safe. There’s a real BioShock vibe to the entire game, from the revelations that are made about Henry’s past to the retro aesthetic that clings to every corner of the game’s dilapidated setting. 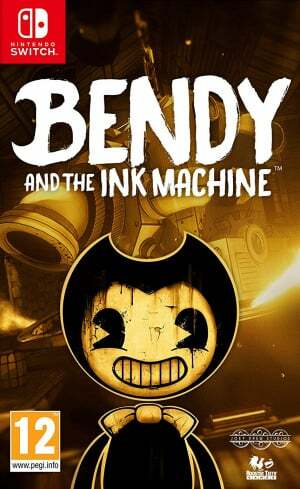 You’ll battle monsters made of ink one moment, then be faced with ones you can’t possibly face – including the titular Bendy – the next. In these sequences, you’ll be employing that overly familiar need to run and hide in order to reach the next area in one piece. However, it’s these well-known elements that start to chip away at the game’s own unique personality. The fact Bendy And The Ink Machine is trying to cover so many horror bases makes it a real hodge-podge of great and poor design decisions. Jump scares come thick and fast, but they’re used so often that even the scarediest of cats is going to grow accustomed to the telegraphed setup each time. Enemy AI is also frustratingly dumb, with some of the inky horrors you encounter effectively watching you hide behind a door, only to walk off, seemingly nonplussed as to your location. It’s a game that wants to be part BioShock, part Outlast: Bundle of Terror and part Resident Evil, but beyond capturing a consistent sense of dread throughout, it never comes close to those aforementioned classics. Performance on Nintendo Switch can be very patchy at times, too. The framerate is meant to sit around 30fps, but we encountered consistent chugging, especially when outrunning foes or in puzzle rooms with a few too many moving parts. The issue doesn’t break the game, but it can take you out of the moment when playing something that requires you to be utterly invested in its unsettling experience. If you’ve already played Bendy And The Ink Machine elsewhere, this technical problem will probably be a bigger issue than if you’re picking this up for the first time on Switch. There’s also a little more blurring and rough textures in this version of the game as well, but its cartoon-ish aesthetic helps negate this somewhat. We'll also address the elephant in the room while we're here; Bendy And The Ink Machine's '20s and '30s aesthetic draws obvious comparisons with another recent game that uses this art style, Cuphead. 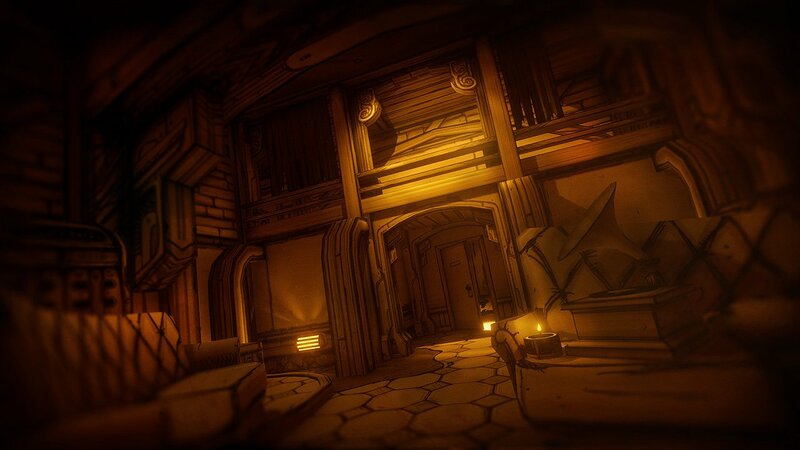 While it's easy to claim that the developers have 'copied' this approach, Bendy has enough of its own visual personality to stand on its own two legs – and this is such a vibrant and engaging period of animation that we don't mind more than one game using it for inspiration. 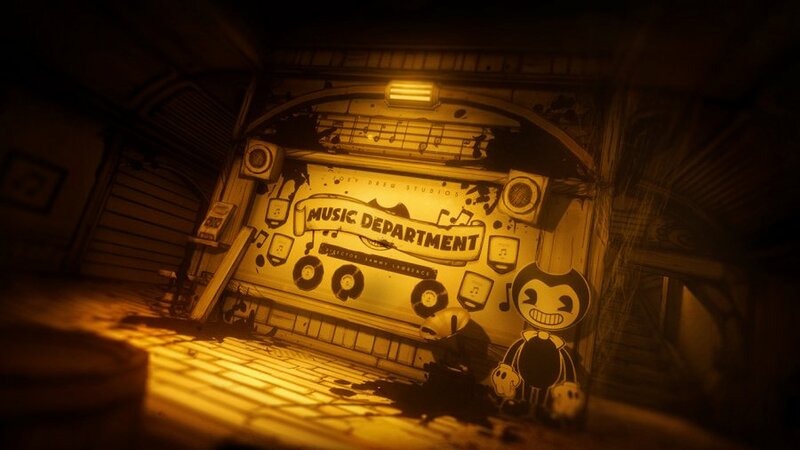 Bendy and the Ink Machine has plenty going for it as a new horror instalment on Nintendo Switch – such as the way it builds a growing sense of dread and despair throughout its five chapters while using an animation style that’s meant to evoke the safety and joy of childhood memories – but it’s let down by some irritating design decisions and frustrating performance issues. Still, if you really do love your horror and want something that ticks all the boxes of a modern scarefest, Bendy and the Ink Machine is still a worthy descent into madness. Aww man, I didn't know about this game but I love the art style. It's a shame the gameplay just isn't as good. This game is pretty big an youtube. I'm not really a horror junkie, so it's not for me. However, it is surprising seeing such a praised game everywhere else with a low score for a change. Next paycheck it’ll be mine! I can’t wait!!!!!!!!!! That’s it! Someone says everything I own on steam has to be ported to switch ?! So I can be broke AF TWICE ?? The physical version is a GameStop exclusive, so I grabbed it when they had it on sale for $20. I haven't had a chance to play it yet but love the look of the art from the videos I have watched. I remember that my little cousin was watching some random garbage on YouTube about this game. Very familiar with the franchise due to my daughter and nieces finding it on YouTube. So Very Terrifying, spin-off Disney. I'm pretty sure Bendy was originally released long before Cuphead, and though both have a retro cartoon aesthetic, they are really quite distinct. Haven't played the Switch version yet, but both my son and I loved Bendy on PC. This score seems lower than the game deserves, IMHO. For the record, I had nothing to do with this game and I had this avatar since 2013 or so. It's from my time as an animation student. I am curious about that game due to the resemblance though, but from what I heard it's basically "a horror game for new to the genre/kids". Not really my jam. Do you want to see my Ink Machine? I'm not sure why the author thinks the cartoon style is supposed to evoke wholesome familiar memories of childhood. There's not a single game player alive today who grew up with these ancient cartoons from the turn of the 20th century. They are instinctively weird and disturbing. Those eyes! @TheFongz Maaaaan, so you think. - I have whole playlists of B/W Silly Symphonies on YouTube that I have my kid watch on the reg. ...and I only knew about those because I grew up watching them too. - This is definitely familiar stuff to people. ...Go get you sum innernet, son. @Quincy wow, that only took 10 minutes! I don't like horror much so I'll probably not get this for my Switch. I love Cuphead though, so if other games come along with 80 year old animation stylings I'll be interested. 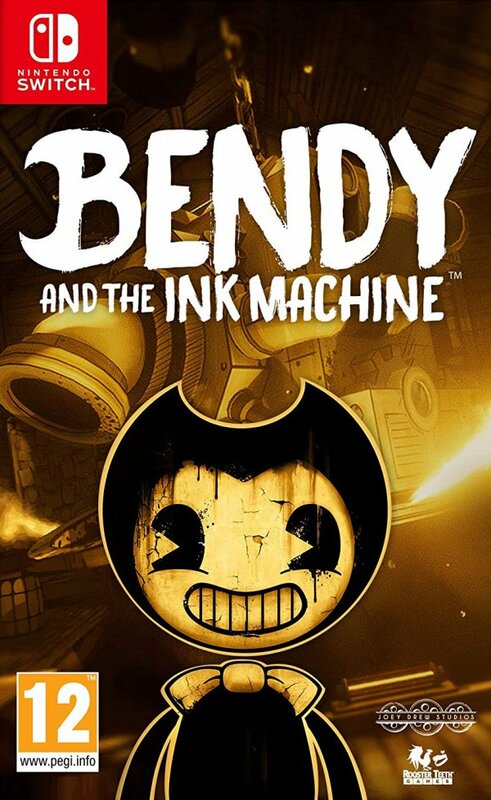 More like "Bendy and the Stink Machine", amirite? That's the best thing Dom's written since he's been here. I was initially intrigued based on the art style, but after a bit more research I decided against this one. I'd say this review reinforces that decision. @klingki This review seems to be an outlier. @kirbygirl That may be, though the only other review of the Switch version on Metacritic right now is a 65. Regardless, I didn't make my decision based on this review, I had already decided against it based on personal tastes. It's nothing against this game. It still seems pretty decent overall, probably better than a 6 if you're one that really likes the genre or style, but I have too many other games in the backlog to justify adding this one when I'm questionable on it. Was curious about this one but after seeing abysmal reviews I think I’ll invest in a better title like Little Nightmares or Okami for the same price. After seeing a Let's Play of this game, there's no way I would play it, not because it's scary, but because it's not. It also overall looked incredibly boring. The aesthetic of this game is not really very original. The horrific “Max Fleischer” vibe has been done in comics, arts, and video games for at least 20 years. @TheFongz You and I sound to be the same age. (Mid to late 30s) - Yeah you can totally cherry pick whatever you want your kids to get exposed to. - side note: I suspect you were around when MTV started sucking too. Always bummed me out. ...but now you can just create huge playlists on YT and broadcast on your TV. It’s goodtimes again, my friend! @SmaggTheSmug Was going to ask where you went to study animation, bit since I see you're from Poland, I'd say it's outside my realm of reasonably close places I'd be willing to study (unless you took online courses.) I'm a huge animation buff and would love to brave the field someday. I have an Adobe Creative Could subscription to use Animate specifically, but unfortunately college makes it difficult for me to find the time to make anything. @klingki Yeah, the Switch version just came out last week, but it first came out on Steam a couple of years ago, IIRC (chapter by chapter release). Lots of other reviews of this game out there, the majority of which are quite positive. @ButterCup is at Gamestop on physical. I got it for $20. Now I really want to see Cuphead come to the Switch so bad. @NybroCymerej lol 😂 NO MAN NO! Put your freakin ink machine away. This is the kinda game ya can buy n finish over a weekend or trip away somewhere n then trade for your coin back a few days later. Its not a great game but its by no means bad and does some things very well. Well worth the experience as a short term or cheap purchase though.